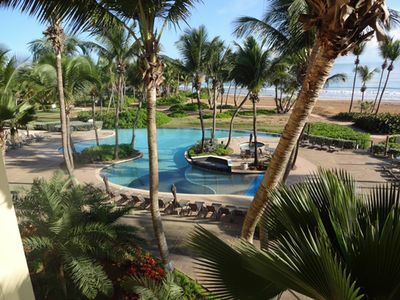 Enjoy our beachfront condo located in one of Puerto Rico's finest beaches. You will be staying in a beautiful, clean, and fully-furnished vacation condo in the small town of Isabela. We are located just 15 minutes from the Aguadilla Airport (BQN) and 1½ hours from the San Juan Airport (SJU). This 5th floor unit has three bedrooms, two bathrooms, a fully equipped kitchen, and a laundry with washer and dryer. From the condo balcony you will see the Isabela mountains and well as the Atlantic Ocean. The condo also has cable TV and high-speed wireless internet access. An elevator provides for easier access to seniors and disabled individuals. This condo is part of Isabela Beach Court, which is a gated community with controlled access and 24-hour security. 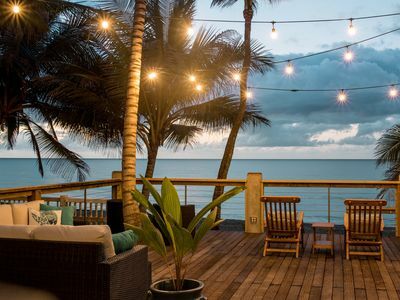 It offers many resort amenities including basketball and lighted tennis courts, gymnasium, playground, picnic gazebo, swimming pool and children's pool. It also has a beach gate for direct access to the Punta Sardinera beach. 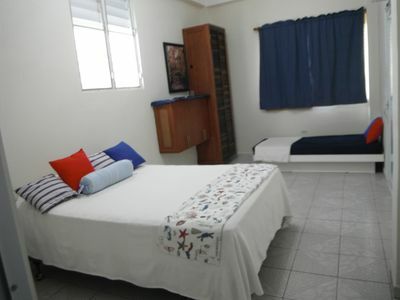 The condo is a close drive to the Montones, Jobos, Shacks, and Golondrinas beaches. The Aguadilla Crash Boat beach is just a 15 minute drive away. These beaches offer many great water activities such as surfing, swimming, fishing, spectacular snorkeling, and underwater cave scuba diving. You can also take a short walk to Villa Pesquera (Fisherman’s village) were you can enjoy restaurants, stores, and beachfront night life. 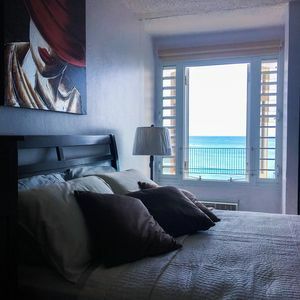 The condo location provides easy access to a good selection of grocery stores, restaurants, shopping malls, movie theaters and recreational facilities such as horseback riding, scuba diving, and the Punta Borinquen Golf Club. There are plenty of shopping choices along Route 2 just 5 miles away. Other area attractions include the Rio Camuy Cave Park, Las Cascadas Water Park, the Arecibo Observatory radio telescope, and Guajataka forest. 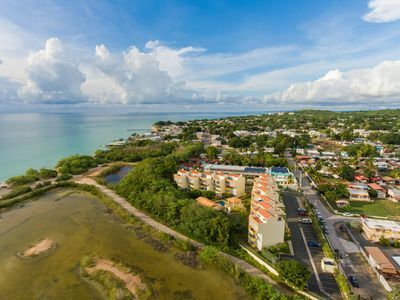 This location is also perfect for the corporate traveler due its proximity to the Aguadilla and Isabela industrial parks, the Aguadilla airport, and Route 2. 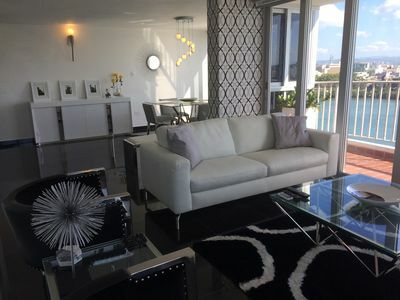 This condo offers all the amenities you would expect in resort villa or corporate rental. 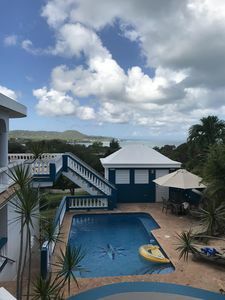 Vieques - Large Apt W/ Pool Access In Puerto Rico Caribbean Paradise. 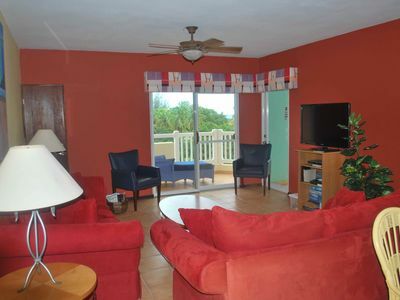 ★ Apr 27-Nov 15 Discounted ★ Beachfront on the Famous & Stunning "Sandy Beach."